With Halloween fast approaching, why not get in the spooky spirit by planning some great Halloween themed activities for you and your little one? While it can be a frightening time for young children, there are some fun packed activities your toddler can enjoy. 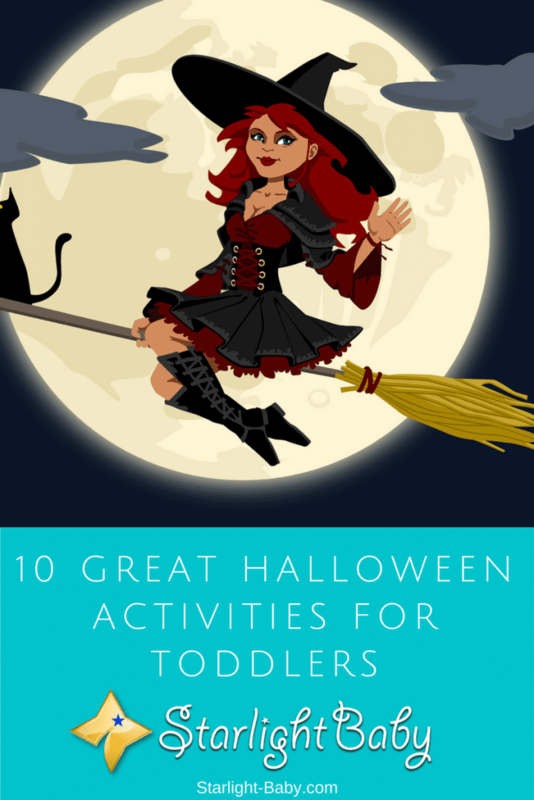 If you’re struggling for inspiration, below you’ll discover 10 of the best Halloween activities you and your toddler will love. Bowling is a firm family favorite, especially for toddlers! What’s more fun for your little one than getting to throw things and knock things down? It’s super-easy to create your own Halloween style bowling night. All you need is either some light, plastic bowling pins, or some plastic bottles, a light ball, some paper and coloring supplies. Draw some spooky themed faces and let your toddler color them in. These could be ghosts, witches, vampires or spiders. Once your little one has colored them in, cut them out and stick them onto the bottles or pins. All that’s left now is to line them up and knock them down! You can make it more fun by having Halloween themed prizes for each time your toddler knocks the pins down. Make up your own rules and enjoy hours of fun bowling from the comfort of your own home. Something else your toddler is going to love, Halloween cookies aren’t just fun to make, they’re fun to eat too! Along with basic baking ingredients, you’ll need a few decorative supplies. If you’re not confident coming up with your own Halloween cookie decoration themes, you’ll find plenty of recipes online. It doesn’t have to be cookies either. There are lots of Halloween dessert recipes for kids and whichever you choose to make, it’s guaranteed to keep your toddler happy. One of the main challenges you have when trying to come up with Halloween ideas for young children is finding something that isn’t too scary. If you don’t want to risk traumatizing your toddler, tissue paper mummies are exactly what you need. This is one of the easiest activities on the list, making it perfect for young toddlers. All you’re going to need is an empty toilet roll, plenty of white tissue paper, glue, white yarn and decorative googly eyes. You can find full instructions on how to make these here. Once completed these tissue paper mummies look adorable and can be used as Halloween decorations around the home. Throughout the toddler stage, your little one will love everything that stimulates their senses. Not only are sensory activities something they enjoy, but they also help your little one to learn. So, if you’re looking for a fun, yet educational activity then a great one to try is a rice filled pumpkin. Simply carve out a pumpkin and fill it with colored rice. Let your toddler pour the rice into the pumpkin, placing it over a plastic bin or anything that will catch any spills. This very simple activity is super-fun for toddlers as it stimulates many senses. First, they love the sound as the rice fills up in the pumpkin. They also love the look of the different colors and the feel of the rice. You could even create several sensory themed pumpkins by filling them up with different things. Seeds and beans are other great options, while you could even use something gooey in one of them such as toddler friendly slime. It may be messy but your little one will love getting their hands dirty and experiencing the different textures. Toddlers love to paint and you can use that to your advantage this Halloween. Spider painting is a great unique twist on this much-loved activity. Grab a bag of small plastic spiders, some larger spiders, various colors of paint, a serving platter dish and large sheets of paper. Pour different colored paint into each section of the serving platter dish, placing the small spiders in the middle. Then, let your toddler dip the spider’s legs into the paint and place them onto the paper. It’s a unique alternative to using paint brushes! It’s important to supervise your little one constantly with this activity, otherwise they may end up sticking the paint filled spiders in their mouth while you’re not looking! Singing is fun and can be a great way to celebrate the upcoming holiday. You’ll find lots of great Halloween themed songs online, but why not attempt to create your own songs? Doing this not only makes it more fun for you and your toddler, but it also helps you to create long-lasting memories. The songs you create can become an annual tradition; something you and your child will remember for years to come. What else do toddlers love? Dressing up! While you can easily buy ready-made toddler Halloween costumes, it can be a lot more fun to create your own. The mummy costume is one of the easiest and most affordable to create. The only thing you need for this is toilet paper. You can wrap it around your little one’s legs, arms and body. Obviously be careful you aren’t wrapping it too tightly! You don’t need to wrap it everywhere, just enough to largely cover the body, ensuring your toddler can still walk is enough! Then, once they’ve had a little fun pretending to be a mummy, they can rip the toilet paper right off for a bit of extra fun. Another crafty idea is to create your own Halloween cards. A super-sweet idea, is to create ghost cards using your little one’s feet. All you need is some black card, white paint and some small googly eyes. Place your toddler’s foot into the paint and get them to press down onto the front of the folded card. Once the little footprint is dry, stick on a couple of googly eyes and you have the basis of your Halloween card. You can then choose to leave it like that or add some extra decorations before writing them out and sending them to friends and family. There are hundreds of Halloween themed cards you and your toddler can create and it’s a great way to spend an afternoon. If you’re looking for an activity your little one can entertain themselves with while you crack on with a few chores, Halloween coloring is a fantastic idea. There are specialized Halloween themed coloring books you can buy from your local book store, or you can print out your own pictures online. Of course, this list wouldn’t be complete without good old fashioned pumpkin decorating. While your toddler isn’t going to be able to carve a pumpkin, they can help decorate them. Pumpkins are everywhere now, so pick a couple up and make sure you’ve got a good selection of children’s paints. You’ll be surprised by how much your toddler enjoys painting their own pumpkins. The 10 ideas above are guaranteed to keep you and your toddler happy and occupied this Halloween. The key is to get crafty. You don’t have to be a natural artist and your creations don’t have to be perfect. The main thing is spending time with your little one and creating long-lasting memories you’ll both cherish forever. Got any more toddler Halloween ideas? Share them below, we’d love to hear them! Just the night before, I came across multiple posts from different blogs and forums talking about Halloween. Right now am feeling like I live in a completely different world than you guys. Why? Bcause we don’t recognise nor celebrate Halloween over here. With all this tips, I only wish i could get to experience Halloween. Halloween is one of my favorite activities I love engaging in, I always don’t miss out to get creative any Halloween season, it thrills me a lot. Reading up here how to get toddlers more involved in Halloween costume is very interesting. The one I found most enticing is using tissue paper for making mummies. I will definitely get my young ones into such and see how creative they could become.